Psychogenic non-epileptic seizures (PNES) present with a sudden change in behavior, perception, thinking, or sensation that closely resemble an epileptic seizure. However, they are not accompanied by electroencephalographic (EEG) changes that occur with an epileptic seizure and are instead due to psychological difficulties. It can take an average of seven years to properly diagnose a patient with PNES. In Great Britain, PNES is called non-epileptic seizures disorder (NEAD). In the past, they were called "pseudoseizures;" this term is now considered outdated. It is not uncommon that a misdiagnosis of epilepsy is carried by patients prior to receiving the accurate diagnosis. This website is administered by a group of specialists in PNES from around the globe who work together to build public awareness and a reservoir of information for health professionals. The purpose of nonepilepticseizures.com is to create the most comprehensive consumer information, public and professional education website on PNES in the US and other English-speaking countries. In order to achieve this, we plan to have roughly two sections: one for the PNES community (patients and loved ones) and another section for health professionals seeking reliable information and updated on scientific reports about this health disorder. Both sections are open and can be visited by anyone. Some examples of our content for the general public include a link with treatment referral sites for patients seeking care and a frequently asked questions section. An example of the professional content is a repository of peer-reviewed articles on PNES organized by topic for professionals. In recent years, there has been a growing amount of research distinguishing important differences within PNES (not all patients who carry this diagnosis are the same and there appear to be several distinct subgroups) and more importantly, scientific research on effective treatments being conducted in the USA and Great Britain have produced promising, if yet very preliminary, results. This website aims to highlight these advances and ensure that they reach the audience who can most be helped by knowing about them. With this site we are initiating an exciting new chapter in the world of PNES that we hope will have an enduring benefit for individuals suffering psychogenic seizures and anyone whose life has somehow been touched by these seizures. Toward the Integration of Care. Taking Control of Your Seizures. Gates and Rowan's Nonepileptic Seizures. In Our Own Words: Stories of those living with PNES. In Our Words: Personal Accounts of Living with Non-Epileptic Seizures. 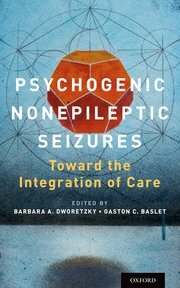 Psychogenic non-epileptic seizures: A Guide. Crisis no-epilépticas piscogenas: Una Guía. Have you ever seen a psychogenic non-epileptic seizure (PNES) depicted in a movie or TV show?